Do you have a 1911 or other 45 ACP pistol? If so, then this ammo is perfect for your next range day. 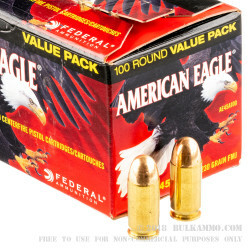 This Federal American Eagle ammunition, in 45 ACP, features a 230 grain full metal jacket bullet. This load is not new to 45 auto pistols, in fact it is the exact same as the ammo used by the US military when they carried the 1911. It is a load that results in proper function, moderate recoil, and excellent accuracy. And when paired with a 230 grain defensive load, this ammo make a great defensive training round. Federal American Eagle ammunition is manufactured in Anoka, Minnesota. The Anoka plant is also where the rest of Federal Premium ammunition is produced. 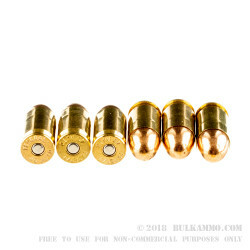 Each round is loaded using a Boxer primed, reloadable brass casing. Bulk Ammo has what I need! period! 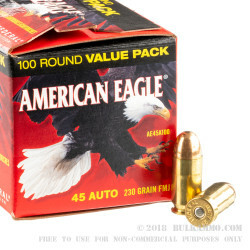 Great ammo at a reasonable price. Seems to run cleaner than the 9mm equivalency. FTE the first 20 rounds but apparently no fault of the ammo. Magazine locked and release had sheared. Faulty magazine. Sent firearm back to company for repair. Once the weapon was repaired and returned I ran 75 rounds through it without any difficulties. Worked great on the range and will seriously considering repurchasing. 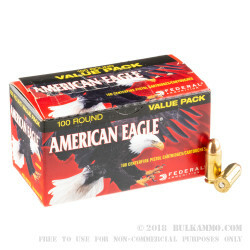 Bulk Ammo is by far the best bargain around. Consistent, great deals, in stock and quick shipping. Huge problem = For the local retailers !!! The local shops are still good, don't get me wrong - But,,,, they don't always have what I want in stock and when they do,,, it's not a better price than what I can get it for here online. As long as that statement holds true, I will always get what I need here. Excellent product, price, service and delivery! A: Hello Mike! Federal lists the muzzle velocity of this round at 890 fps with a muzzle energy of 369 ft. lbs.